When the male bearded manakin snaps its wings at lightning speed, it's more than part of an elaborate, acrobatic mating ritual. The tiny muscle doing the heavy lifting is also the reason this exotic bird has evolved into four distinct species, according to new research published in the journal eLIFE by Wake Forest University biologist Matthew Fuxjager. Fuxjager's previous research showed that the tiny bearded manakin, which measures a little more than four inches long and weighs about half an ounce, has one of the fastest limb muscles of any vertebrate. During an elaborate courtship dance, it uses this muscle – the scapulohumeralis caudalis – to make a unique "roll-snap" movement at speeds so fast it's undetectable to the human eye. The roll-snap creates a mechanical popping sound when the wings connect above the back, all to catch the female's attention. Fuxjager's new study, "Physiological constraint on acrobatic courtship behavior underlies rapid sympatric speciation in bearded manakins," is funded by the National Science Foundation. The research team includes Wake Forest doctoral student Meredith Miles. Fuxjager, assistant professor of biology at Wake Forest and the study's principal investigator, looks at how the manakins shared a common ancestor 300,000 years ago, but then quickly split into four species: white-bearded manakins to golden-collared manakins, and then to white-collared and orange-collared manakins. The core goal of all his research is to understand how and why animals produce remarkable behaviors. This study does something that others rarely if ever do: It examines not only how a small group of animals evolved, but also how they behave overall and how a specific muscle in these organisms performs. This three-pronged approach showed the researchers how muscle speed and performance influenced the split into four species. Fuxjager traveled to Panama and Costa Rica to measure how fast the manakin's scapulohumeralis caudalis expands and contracts when stimulated, and compared recordings of the manakin roll-snap sound display to note variations in speed and duration among species. The patterns show changes in physiology led to changes in behavior – and then the evolution of four manakin species. 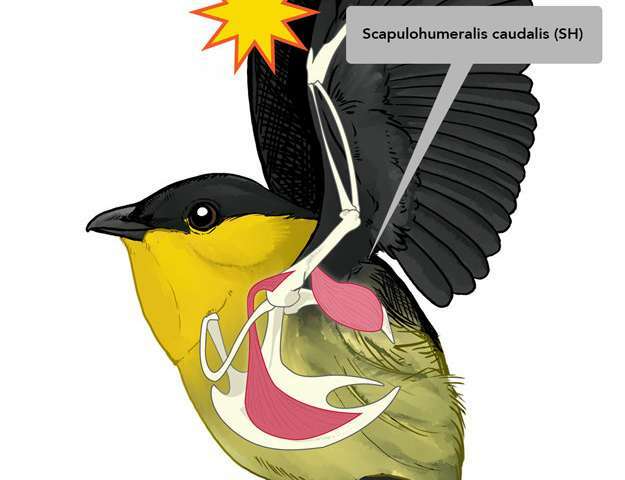 The study of superfast muscles such as the bearded manakin's scapulohumeralis caudalis may inform research into how diseases such as ALS attack muscles in humans, Fuxjager said. "Humans are interested in motor control and muscle performance – what makes a muscle fast, what makes it strong, and what might make it both fast and strong," he said. "Understanding how the super-performing muscle in this bird works could lead us to a better understanding of muscle diseases and how to treat them." The article never explained why the different species evolved.